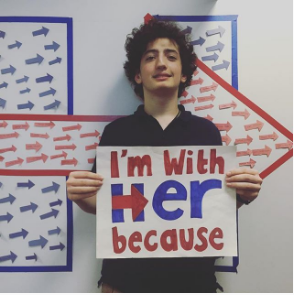 This summer I volunteered at the Brooklyn Heights headquarters for the presidential campaign of Hillary Clinton. As everyone is aware, while all elections are important, this is not your average election. There was no perfect candidate. But the only other viable candidate was Donald Trump, who needs no introduction. Furthermore, I had long entertained the idea of getting involved in the political process; the idea of participating in my democracy even if I was unable to vote had appealed to me for a while, and this was the mother of all democratic processes. Besides, I needed to o something over the summer, and I figured that I may as well do some good in the world. Once I was approved to volunteer, myself and Nidhin Nishanth went to headquarters in Brooklyn Heights to phone bank. We called voters all across the country to spread the word about events, allay concerns about Hillary Clinton, help local campaigns spread the word, and generally get out the vote. With a television sitting in the corner of the phone banking room, we could see the latest developments, and even some campaign ads before they were released en masse. Between calls, I was able to talk with other Clinton supporters about politics, the world, and so on and so forth. I also got to talk on a few occasions with undecided voters and republicans who were shocked and disgusted by the antics of Donald Trump. Overall, I had a good experience, and, given the chance, I think I would do this kind of service again. This entry was posted in Uncategorized by 18litke. Bookmark the permalink. Thanks for sharing, Patrick! I love that you “had long entertained the idea of getting involved in the political process; the idea of participating in [your] democracy even if [you are] unable to vote” and that you found something that you might do again. Go Hillary!